Winners were determined based on the millions of reviews and opinions collected in a single year from TripAdvisor travelers worldwide. In the 16th year of the awards, TripAdvisor has highlighted the world’s top 8,095 properties in 94 countries and 8 regions worldwide. 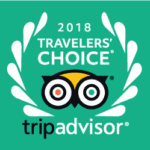 Craigleith Manor B&B has been named one of the Top 25 B&B/Inns in Canada, and we are honoured to be a member of top 1% of accommodations on Trip Advisor worldwide that receive this honour. The awards celebrate hotel winners in 10 categories, including Top Hotels Overall, Luxury, Bargain, Small, Best Service, B&Bs and Inns, Romance, Family, All-Inclusive, and Value for Money. The hallmarks of Travelers’ Choice hotel winners are remarkable service, value, and quality. The Certificate of Excellence honours hospitality businesses that deliver consistently great service across the world. The designation is presented to approximately 10% of the total properties on TripAdvisor that have consistently achieved great reviews over the previous year. We do not apply for this award. It is based on reviews from our guests and is generated by Trip Advisor. We thank all our amazing guests for their honest reviews of our business. We are honoured that so many guests chose to leave reviews about their experience staying at the Manor. We appreciate the honesty and candor of the reviews. Feedback from guests is the cornerstone of our excellence and continuous improvement to meet ever-evolving guest needs. You can read TripAdvisor Reviews here. We are proud to be a member of FOBBA and to have had our B&B inspected, approved and star rated by an independent review. FOBBA members agree to adhere to high and consistent standards defining cleanliness, comfort, quality, safety and hospitality. We have been a member since 2015 and have been renewed annually since then. 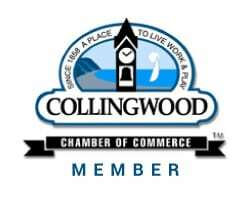 Craigleith Manor has been a member of the Collingwood Chamber of Commerce since 2015. 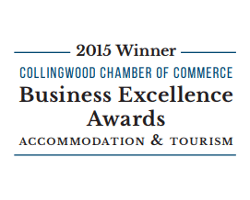 We have been awarded two Business Excellence Awards since then. The awards acknowledge the efforts of our bed and breakfast in supporting Collingwood as a premier tourism destination. We have won this award in both 2015 and 2018.